What happens in Vegas…stays in Vegas, brightened by neon-coloured lights and guided by the rumble of rolling dice. What's to love in Las Vegas? Seeing sensational shows or sports, hobnobbing with high rollers and dancing the nights away! Getting married by Elvis? Sure. Fine dining at its best? You bet! Whatever happens in Vegas, you’ll leave feeling like a winner. You name a celebrity chef and we’ll name their restaurant in Vegas—try dishes across town in establishments run by the likes of Guy Fieri, Giada de Laurentiis, Wolfgang Puck, and Gordon Ramsay. Merchandise from your Vegas show of choice (a Criss Angel tee? ), collectible dice from the iconic Golden Nugget Casino, and maybe a marriage certificate, you never know. Las Vegas may be known for its bright lights and entertainment-filled nights, but truth is, there are even more dazzling sights if you are willing to venture past the Strip. From man-made marvels to natural wonders, here are 6 sightseeing musts near Las Vegas. Built between 1931 and 1936 during the Great Depression, Hoover Dam was one of the largest US government projects of its time and remains an engineering wonder. It’s located between Arizona and Nevada and spans the Colorado River in the Black Canyon. Architecturally beautiful, the structure stands out for its curvilinear arch and art deco design. The dam is also home to Lake Mead, the largest reservoir in the US. How to get there: hop on a bus tour, rent a car, or take a helicopter ride. How far from Vegas: approx. 1-hour drive; flight times vary depending on chosen tour. Considered one of the Seven Natural Wonders of the World, the Grand Canyon is a spectacular sight. If heading to the West Rim on a ground tour, you’ll likely travel through a desert forest of Joshua trees, while an aerial tour will provide views of Hoover Dam and Lake Mead. Key highlights of the West Rim include Hualapai Market for Native American crafts at Guano Point and the Grand Canyon Skywalk at Eagle Point. Going to the South Rim instead? As part of the Grand Canyon National Park, the South Rim offers picturesque trails and views at Mather Point. Bright Angel Lodge, a historic hotel complex located directly on the edge of the Canyon itself, is another must-see. A helicopter tour of the South Rim takes you over Dragon’s Corridor, the Tower of Ra, Kaibab National Forest and the Colorado River. How far from Vegas: approx. 2.5 hour drive (West Rim) or 5-hour drive (South Rim); flight times vary depending on chosen tour. Laughlin is no Vegas, but this gambling city’s smaller-town-feel and lower costs make it an attractive alternative to the glitz and glam of the Strip. In addition to casinos, you’ll find shopping, spas and golf courses. Its location on the banks of the Colorado River and its proximity to Lake Mohave also mean opportunities for fishing, swimming, boating and other aquatic activities. How to get there: hop on a bus tour, or rent a car. 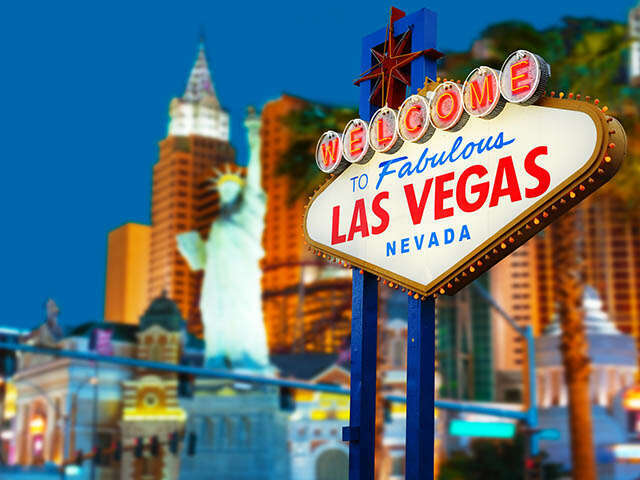 We offer a tour to Hoover Dam, Grand Canyon National Park and Laughlin with Grayline Las Vegas—call us to book! Don’t be fooled by its name—although Death Valley is the hottest area in all of North America, if offers tons of natural and historical riches. Just make sure to see them in an air conditioned vehicle or during cooler hours of the day! Among its hidden treasures is Scotty’s Castle, a Spanish-style villa that was built in the 1920s after a conman successfully convinced a millionaire to invest in his “goldmine.” Death Valley’s mysterious aura is also attributed to the Ubehebe Crater (the remains of an ancient and violent volcanic eruption), Badwater Basin (a saltwater basin and the lowest spot in North America) and the Rhyolite Ghost Town. How far from Vegas: approx. 2-hour drive; flight times vary depending on chosen tour. A scenic 21-kilometre drive along Red Rock Canyon is perfect for a day of sightseeing. Take in views of the sandstone Calico Hills, marvel at the limestone roasting pits used by Native Americans, and study the petroglyphs at Willow Springs. A Red Rock Canyon trip would not be complete without seeing Spring Mountain Ranch State Park, previously owned by Howard Hughes, the eccentric millionaire extraordinaire. The canyon also offers 19 hiking trails, as well as opportunities to observe plants and wildlife. How to get there: hop on a bus tour, or rent a car. How far from Vegas: approx. 20-minute drive. Known for its red, white and pink rock formations, Zion National Park is a feast for the eyes. Located in Springdale, Utah, the park offers a stark contrast between desert areas and pockets full of waterfalls, ponds and lush greenery. Some major points of interest include Virgin River, Checkerboard Mesa, Weeping Rock and Emerald Pools. How far from Vegas: approx. 2.5 hour-drive; flight times vary depending on chosen tour. Everything at the Bellagio Hotel is an experience, and its Conservatory & Botanical Gardens are no exception. There are 5 distinct exhibitions per year: one for the Chinese New Year in January, followed by one for spring, summer, fall and winter. Each exhibition is treated as a theatrical production, featuring a colourful assortment of flowers, plants and trees that requires months of preparation. Every half hour between 11:30 a.m. and 11:30 p.m., various circus acts take centre stage at the Carnival Midway at Circus Circus Hotel and Casino. Each segment features stunning performances by acrobats, trapeze artists, or jugglers. Make sure to get there at least 15 minutes in advance if you want to get a seat! Are you a novice when it comes to casino games? No need to worry! Several casinos in Las Vegas offer free gaming lessons to get you started. They’ll introduce you to the basic rules, etiquette and strategies for games such as poker, roulette and blackjack. The Luxor, Mandalay Bay and Excalibur are among casinos to offer such lessons. This free fountain show takes place inside the Forum Shops at Caesars. It tells the tale of sibling rivalry, as the son and daughter of King Atlas battle over who should take over as ruler of Atlantis. The story is brought to life by kitschy, 9-foot tall animatronics, as well as colourful water and fire effects. While you’re there, you can also marvel at the 50,000-gallon saltwater aquarium that surrounds the area. The Wildlife Habitat at the Flamingo Las Vegas Hotel and Casino is like a miniature oasis amid the hustle and bustle of The Strip. Chilean flamingos, exotic ducks, swans, Japanese koi and yellow catfish are among the wildlife you can observe here. Ever wondered what it’s like to be an executive for a major TV network? At the MGM Grand’s CBS Television City Research Center, you can be an exec for a day! You’ll learn the ins-and-outs of deciding which shows get put on the air, as you view a selection of shows and learn how to register your opinion on the cast and content of each one. No need to go all the way to Italy to get a taste of the Carnevale di Venezia (Carnival of Venice). For a quick glimpse into what the Italian festival is all about, head to the Grand Canal Shoppes at the Venetian Hotel and Casino. Every day (at different intervals), a troupe of gondoliers, living statues and jugglers put together a lively performance that emulates the famous Venetian carnival. The Volcano at The Mirage is a spectacular sight, featuring 2 volcano systems, a lagoon and fire shooters that shoot flame more than 12 feet in the air. As if that’s not enough, the fireballs move to the sounds of an exhilarating soundtrack created by The Grateful Dead drummer Mickey Hart and Indian composer Zakir Hussain. The sound is so powerful that you can actually feel the rumble of the volcanic movement. No, it’s not the real Paris, but with the amount of detail put into its design, it could be! If you’ve always wanted to see famous Paris attraction like the Eiffel Tower, the Paris Opera House, l’Arc de Triomphe and the Hôtel de Ville, just stroll throughout the Paris Las Vegas Hotel and Casino…for FREE! This one is exclusive to Air Canada Vacations! Book a Flight and Hotel package to Las Vegas and get a free tour of Laughlin, a city off the Strip that has just as much to do as Vegas does (minus the hustle and bustle). This resort destination has tons of casinos, shopping, spas and golf courses to keep you busy, as well as outdoor activities like fishing, swimming and boating.